Another weekend, another brunch? My husband and I had already recently visited Cliff’s Edge in Silver Lake for brunch in their adult treehouse, and we had been to A.O.C. Wine Bar in West Hollywood to dine in their outdoor garden patio with the amazing food from their wood-burning oven, this time, we were looking for something a little different. My husband came to me with an idea to go to a restaurant that he and I had been to for dinner a couple of times, but had never visited during the light of day. I loved the restaurant’s indoor-outdoor setting and intimate dining arrangements for dinner, I was curious as to how different, or perhaps not, it would feel for brunch rather than a romantic dinner. Fig & Olive, located on Melrose Place in West Hollywood, is a restaurant that my husband had taken me for a birthday dinner a couple of years ago. Since that time, we’ve been back to Fig & Olive for dinner a couple of times, but I’d never considered coming back for brunch. In fact, until my husband mentioned to me that he wanted to try Fig & Olive for brunch on Sunday morning, I didn’t even know they were open for brunch. In the light of day, what is a beautiful, twinkling white light lit restaurant at night that gives off an aura of intimacy turns into a convivial, Mediterranean-inspired setting with ceiling fans, and rattan light fixtures and the fragrance of fresh rosemary growing inside the restaurant whose dining room revolves around a gorgeous olive tree. With long benches with fluffy padding and beautiful soft throw pillows strewn about, Fig & Olive really does lend itself to being a terrific brunch location for a nice, relaxing and lazy weekend morning. For my husband, looking over the drink menu during brunch is a no brainer, he already knows what he’s going to order. For me, the classic person who has a tough time making a decision with the easiest of choices, the more choices there are, the harder it is for me. At Fig & Olive, I vacillated back and forth over whether I should order a coffee drink or some other sort of drink. When I saw the menu, there was a mocktail that had caught my eye, the banane et orange, drink made with freshly squeezed orange juice, muddled banana, fresh ginger and lemon juice with clover honey. It sounded like such an interesting combination that I had to order it. To my dismay, after I placed my drink order and waited several minutes, the waiter came back to the table to tell me that he was very sorry, but the bar didn’t have the ingredients on hand to make my drink, so I needed order something else. There’s nothing out of the ordinary in this drink that they wouldn’t have it on hand. I was quite disappointed that in the end I decided to just settle on the same drink my husband ordered, a glass of house made orange juice. 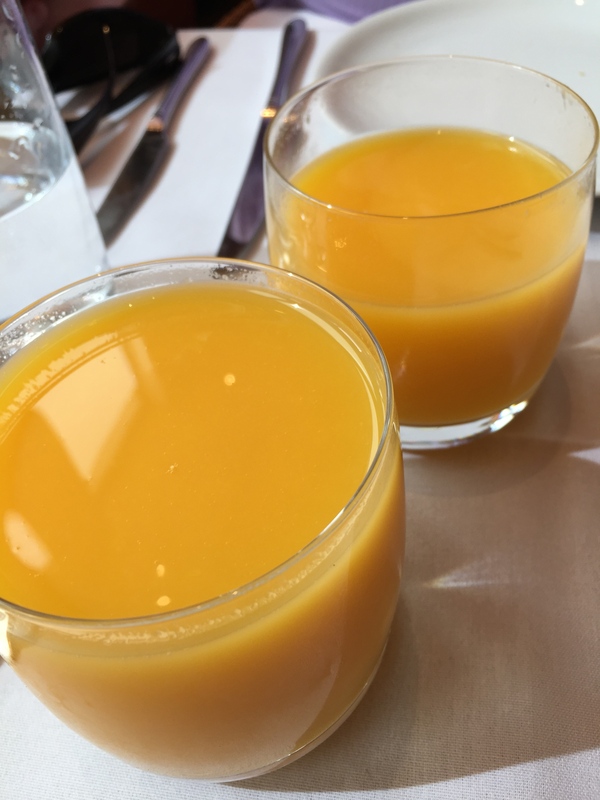 The orange juice was refreshing and delicious, but in the end orange juice is just orange juice and really nothing special. My husband and I have dined at Fig & Olive a couple of times for dinner, but never for brunch so, we weren’t quite sure what to expect. One of our favorite parts of dining in the evening is the olive oil tasting that precedes every meal. To our great delight, they still offered the rosemary bread with the variety of different olive oils as a starter during brunch. From the top of the picture to the bottom, we enjoyed Spanish, Greek and Portuguese olive oils. The Spanish was described as light and buttery, the Greek emitted a citrus flavor as it was scented with lemon peel, and the Portuguese was described as full bodied. 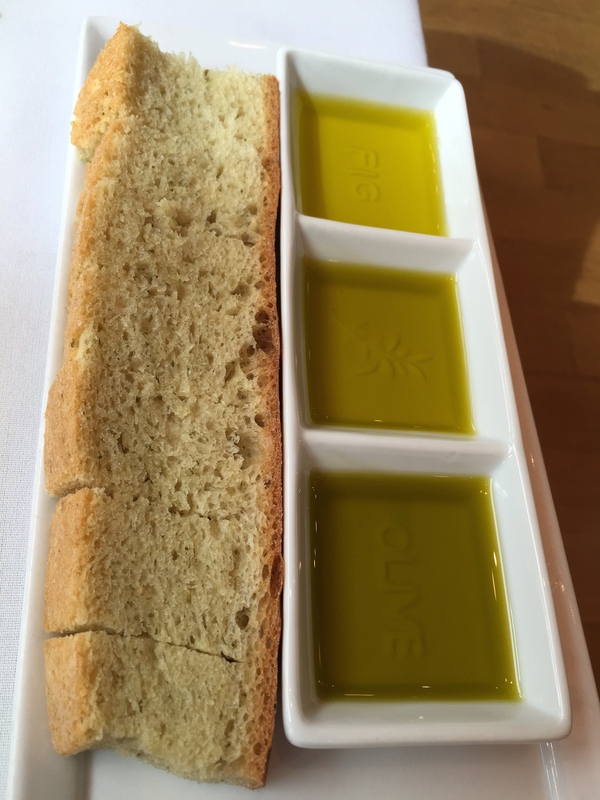 The bread, as usual, was fabulous and a perfect vessel to taste the different olive oils. Personally, my favorite was the light and buttery Spanish olive oil. My husband was a fan of the citrusy Greek olive oil. However, we both agreed that we would have been happy with any of the three different kinds of olive oils. What we love about this tasting session is that you really can taste the differences, even subtle differences, between the different olive oils. It’s true, not all olive oil is created the same. With this brunch meal, we skipped any of the pleasantries of an appetizer or a starter and went straight for the food. While I debated back and forth as to whether or not I wanted breakfast fare, or a heartier lunch meal, my husband was pretty straight forward in that he was looking for breakfast fare. His selection, ultimately, was the truffle mushroom fontina scrambled eggs. I mistakenly thought that this would be simple scrambled eggs, but it was anything but. 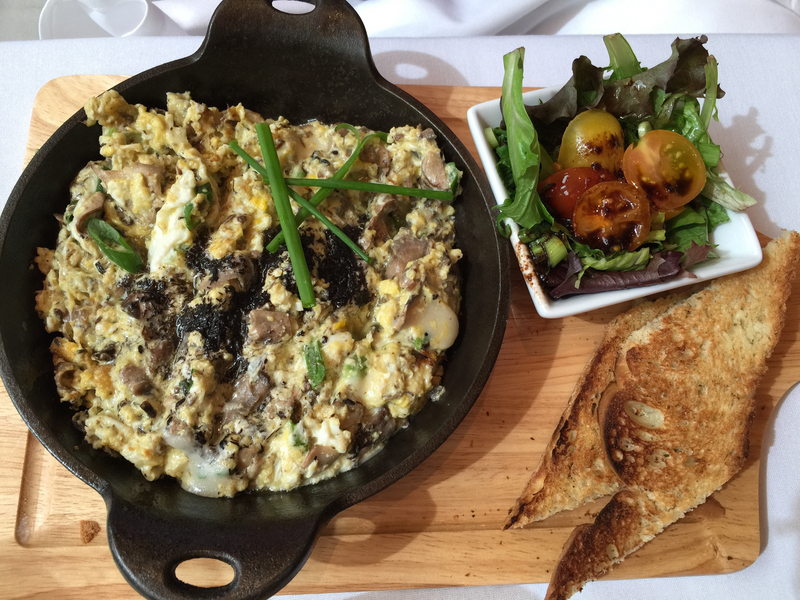 Served in a sizzling cast iron skillet, the scrambled eggs were mixed with a combination of cremini and black trumpet mushrooms. A blend of both mascarpone and fontina cheese were then added into the skillet as well as some scallions. The egg dish was then finished off with white truffle olive oil. First off, my husband loved the mixture of the mushrooms and the large quantity of mushrooms used in the egg scrambler – this is probably because I don’t like mushrooms and won’t cook with them at home. The egg scrambler, as it really was more of an egg scrambler than classic scrambled eggs, was perfect cooked, according to my husband. The eggs were light and fluffy – not undercooked nor overcooked. With the addition of the mascarpone cheese which created a creamy texture and the creamy smooth flavor of the fontina cheese, my husband loved the mixture – but again, there’s nothing with cheese that my husband wouldn’t love. And finally, the white truffle olive oil was a perfect finishing touch to the eggs. The truffle oil was perfect, not too strong or overpowering, but the flavor of the truffles was definitely present. My husband absolutely loved his choice of this dish for brunch. As a complete sucker for smoked salmon, my husband had to order a side of cured salmon to go with his scrambled eggs. Of course, for him, cured salmon goes well with anything, or on its own without any sort of accompaniment. 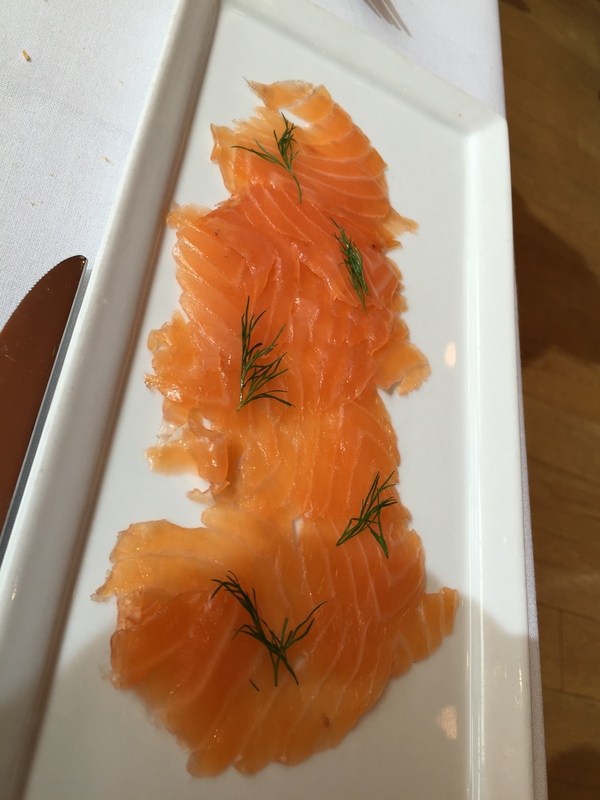 My husband really liked the addition of the fennel fronds on the cured salmon slices, he thought that it really added some nice flavor. Apparently the licorice flavor of the fennel complimented the salmon well and he liked the salmon better when eaten together with the fennel. Normally, if there were any sort of eggs Benedict dish on the menu, that would be the dish my husband would order. But this time, I mentioned first off the bat that I was interested in the Benedict dish, and since my husband didn’t want us to both order the same dish, he decided on the scrambled eggs instead. After I ultimately decided to order a breakfast dish instead of a heavier lunch dish, I ordered the crab cake eggs Benedict. The Benedict was made toasted crostone bread, crab cake, sautéed spinach with shallots and cipollini onions all topped with a poached egg. Tomato and paprika Hollandaise sauce was served in a ramekin on the side. Served on the side of the Benedict was roasted potatoes. First off, I loved the tomato paprika Hollandaise sauce. For me, the Hollandaise sauce is usually the part of the eggs Benedict that I like the least because the sauce is generally too thick for me. What I really enjoyed about the tomato paprika Hollandaise here is that it was really thin, it was like a light sauce instead of a thick, heavy sauce. I also liked that the sauce was served on the side so you could decide how much you wanted to put over the eggs Benedict, and the sauce didn’t just soak through the bread to make it all soggy, which I absolutely hate. The taste of the crab cake was terrific, nice and hot and fluffy inside and crispy and perfectly golden brown on the outside. I also liked that the Benedict was made with crusty, crunchy crostone bread rather than a softer English muffin or something else like that. The addition of the sautéed spinach worked really well with the crab cake and the bread and helped to bring the dish together. And of course, you can’t forget the poached egg, perfectly poached with a completely runny egg inside. It was fantastic and tasty. A great selection for brunch. To prove the point that my husband loves truffle oil, he couldn’t resist ordering a side of skinny fries with truffle oil to go with our meals. 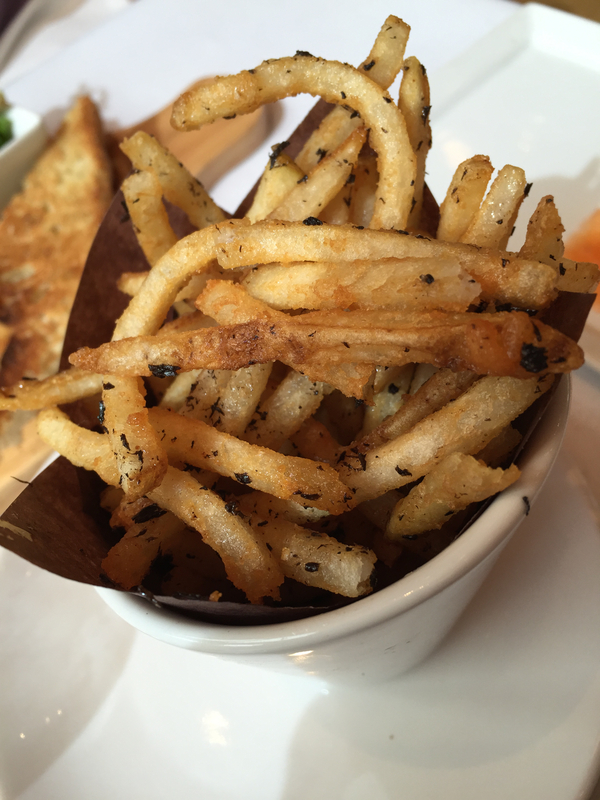 The skinny fries were perfectly fried to a nice crispy texture with a slightly soft potato texture on the inside. The seasoning of the truffle oil was perfect, not too heavy that it overpowered the taste of the fries, but not too light that you couldn’t taste it either. The perfect finger food side dish. By now, I’m sure you’ve figured out that it doesn’t matter that this is brunch, my husband and I are always going to be interested in what’s offered on the dessert menu. For my choice, I ordered the chocolate pot de creme – a dessert I’ve ordered before at Fig & Olive. 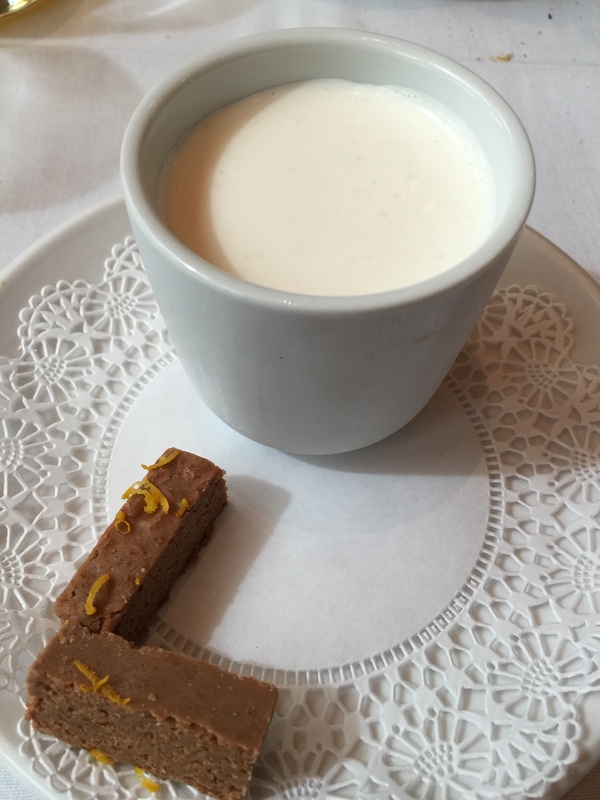 Creamy, vanilla cream atop a mousse-like chocolate pot de creme. Perfectly flavored with a nice chocolate touch but without being too sweet in flavor, the chocolate mousse paired perfectly with the slightly sweetened vanilla cream. The accompanying crunchy praline financier was a real treat, with a slight hazelnut flavor and a crispy, crunchy texture, it was a great little cookie to dip into the chocolate pot de creme. Nothing was too sweet or over the top, and this was a great finishing dish for my brunch. My husband chose a dessert that I knew would interest him as soon as I saw it on the menu, the green apple sorbet. Not that my husband loves green apples, but he does love fruit sorbets, and this dessert was just something different than anything else being offered. The thing that sealed the deal for my husband was the fact that the dish was accompanied by Picholine olive oil syrup. 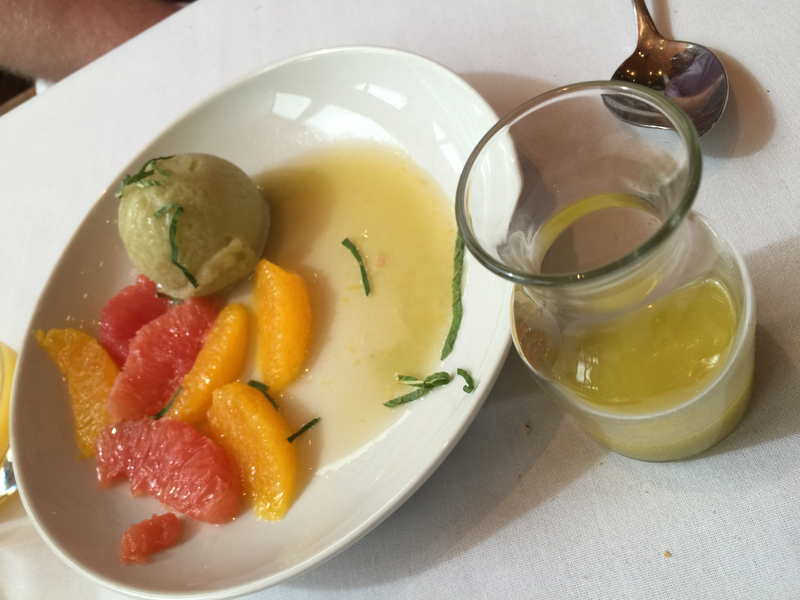 Along with the green apple sorbet was citrus segments and fresh mint. The pairing of the citrus segments and the tart green apple went well together, with a little bit of fresh mint to cut through the acidity. But it was the Picholine olive oil syrup served in a carafe on the side so that you could drizzle as much, or as little, of the syrup over the dessert plate as you wanted, that my husband really enjoyed. The flavorful olive oil created a smooth flavor that rounded out and accentuated the green apple and the acidic citrus fruits. This was definitely a palate cleansing type of dessert. My husband and I really loved dining at Fig & Olive for brunch. The restaurant itself is gorgeous with a very elegant, yet comfortable interior. 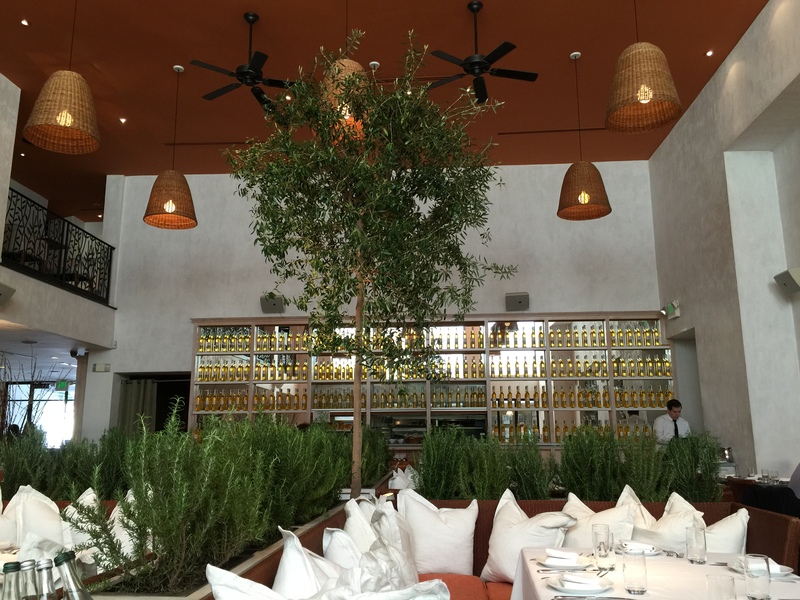 The sunlight shining through and accenting the beautiful olive tree in the middle of the restaurant just helped lend itself to the Mediterranean feel of the restaurant. During brunch, the restaurant feels much more relaxed and casual than it does at night when it feels much more elegant. 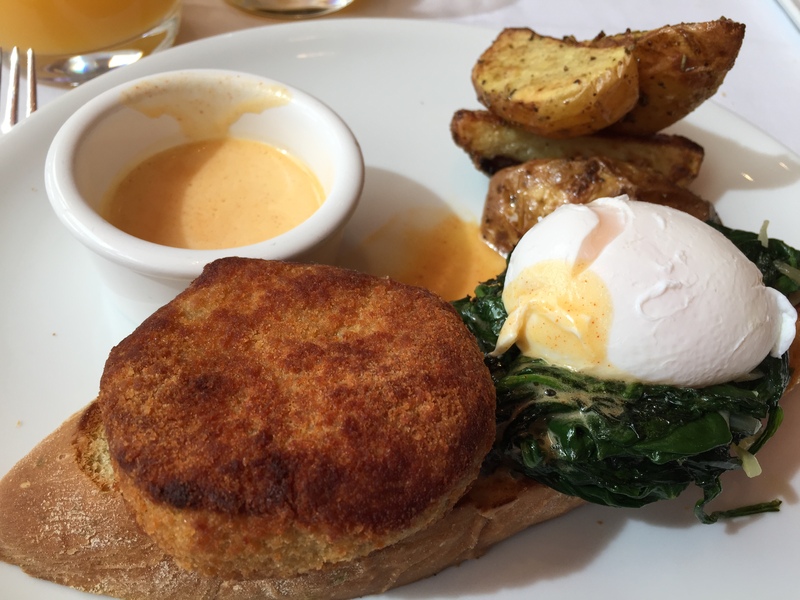 The selection of both an extensive breakfast and lunch menu was terrific, and provided for a greater option of food choices than I’ve seen on the menu at any of the other brunch locales my husband and I have dined at recently. For me, I like this better as I am someone who really enjoys the heavier fare for lunch rather than a light breakfast option. My husband said that for overall experience – the food, the atmosphere, the convenience factor – that his pick of favorite brunch spot out of all of the places we’ve been to over the past few months is Fig & Olive. That sounds like a winning selection for me. Now, when are we going to go back for brunch again?